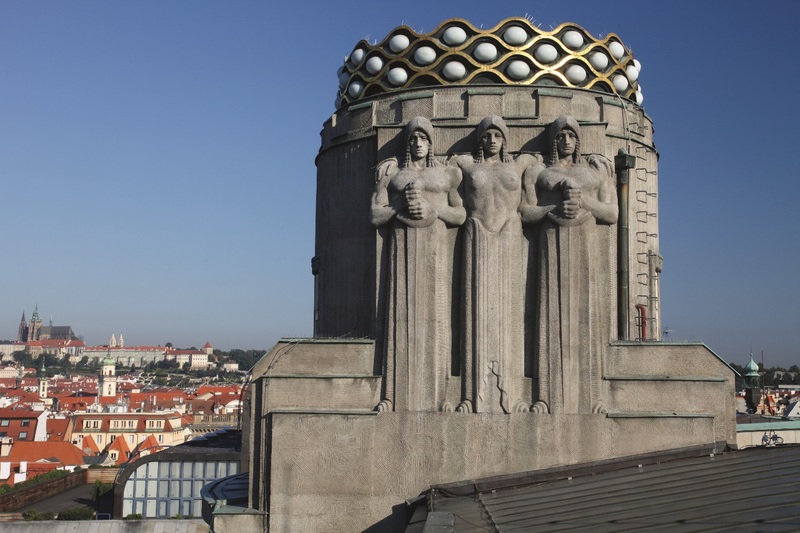 This palace at the bottom of Wenceslas Square was built in late Art Nouveau style. The building's main feature is its corner tower shape, with its peak shaped as a stylized crown. Under the peak is an allegorical statue by Stanislav Suchard. It's a retail-business centre with a number of shops, restaurants and offices. In the second half of the 19th century a well-known house called U Špinků stood here; its entire first floor was occupied by popular Café Vienna. In the 1860s patriots used to meet here, for example František Palacký, František Ladislav Rieger, August Brauner etc. There were newspapers and the very first pool in Prague available for guests. This house was among the first houses built under Karel IV in the New Town. Its Gothic building heart only ceased to exist during the demolition in 1910. 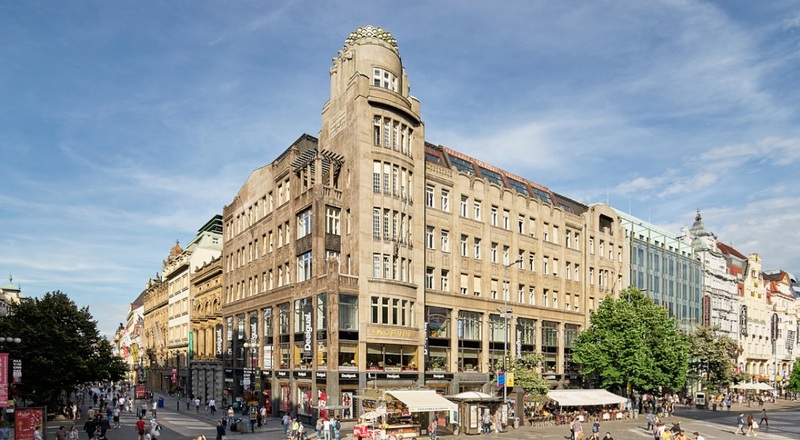 At the site several old houses were demolished in 1911 - 1912 and the First Czech General Joint Stock Life Insurance Company built a splendid palace in late Art Nouveau style at their place. This company with a long name was later renamed to Koruna and thus also the building was named Koruna. The palace was designed by the architect Antonín Pfeiffer in the cooperation with the builder Matěj Blecha. The building has a reinforced concrete frame construction, a few tracts, two floors in the basement and four floors above the ground. In the basement it used to be spa facilities and Koruna cinema crown, which was cancelled after the liberation in 1945. On the ground floor and mezzanine there was a dancing café, other facilities were used as administrative. The palace has a total area of 18,000 square meters. The interior of the building was pierced by the rectangular passage on the ground floor, to which the entrances to most areas led. The main decoration of the building is corner tower unit, on the top styled in the shape of the crown. Below the top there were allegorical statues by Stanislav Sucharda. The corner cupola spanned over the vestibule, where both branches of the passage meet. The vault of the dome has 170 m2 and is composed of several thousand glass fittings, decorated in late Art Nouveau decor in thirty-two types and hundred and twenty kinds of shapes. In this way a wonderful geometric pattern was created that is a creation of great work of arts. On the ground floor of the palace the first Prague food machine was placed, which after inserting certain amount released a sandwich from one drawing of the sliding mini-elevator or brass faucet made the cup of lemonade in the second drawing. Since then, all fast food operations in Prague have been called the "automat". The vast popular buffet or fast food was built on the ground floor of the palace, also called Koruna automat, which was built in 1931 according to the project by architect Ladislav Machoň and occupied 790 m2 sales area, on which hot and cold snacks and beverages were offered. Technoexport, foreign Trade Company had been the user of the whole palace for many years. The palace fell into disrepair and in 1979 a part of the roof dome collapsed. The repair of atypical glass dome seemed to be intractable, but it was finally done in the best quality by glass workers from Nový Bor. In the years 1992 - 1996 General reconstruction of the palace took place according to the project of Achammer, Tritthart und Partner studio from Munich.